According to locals and visitors, the sand on Destin-s beaches, the byproduct of a curious juxtaposition of aquatics and geography, is the whitest in the world. The finely ground quartz crystals, which look more like the sugar in your morning coffee than the sand that squishes between your toes, originate in the Appalachian Mountains. The residue flows down the Apalachicola River to the Gulf of Mexico, where currents create sand drifts along the Gulf Coast, from east of Panama City, Florida, to the shoreline of Alabama. A key part of Florida-s Emerald Coast, Destin attracts millions of visitors every year. The city-s population averages only around 12,000, but, during tourist season, its numbers normally balloon to the 40,000 range. There are 12 separate beach access points, and fishing vessels can be chartered from the harbor. In fact, Destin calls itself "the world-s luckiest fishing village" and lays claim to the largest fishing vessel fleet in the Sunshine State. The city of Destin is situated on a peninsula that separates the Gulf of Mexico from Choctawhatchee Bay. Originally an island, it slowly but surely became part of the mainland through the handiwork of hurricanes and changes in sea level. 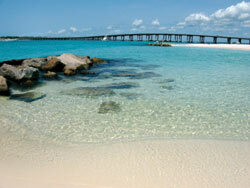 The city-s water entrance is through Destin Harbor, a lagoon that lies between the beaches and the main peninsula. The lagoon is formed by a sand spit named Holiday Isle, where many condominiums line the harbor. The city is connected to Niceville, Florida, by the Mid-Bay Bridge. The larger municipalities of Panama City and Pensacola are located to the east and west, respectively. The area is named for Capt. Leonard Destin, a fisherman who settled there between 1845 and 1850. The captain and his descendants remained for decades and were instrumental in launching the area-s fishing industry. Destin was incorporated as a municipality in 1984 and has experienced rapid growth since. The city features a grand assortment of hotels and motels as well as condominiums. Private homes are available for rent for anyone who wants to see and feel the unique sand, play nearby golf courses or cast a line into Destin-s fertile waters.